Mother's Day Gift Suggestion for the non moms: Savvy Auntie Book | DaDa Rocks! 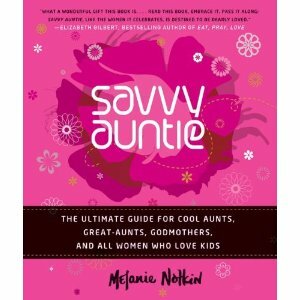 Savvy Auntie: The Ultimate Guide for Cool Aunts, Great-Aunts, Godmothers, and All Women Who Love Kids [Amazon] doesnt the name just say it all? When mother’s day rolls around the aunts without children sometimes get a little blue and thats lame, because Aunts have a great role in a child’s life. I’ve known Melanie for over a year now, she was one of the first bloggers to welcome me to the scene and I couldn’t be happy for her. Not only is her vision for her website crisp and clean but the book is totally on point with being just what the doctor ordered for mother’s day gifts for those aunts. By Melanie’s own admission, the book focused on new aunts of young children. Which is usually the roughest time for those first time aunts trying to figure out what end is up… The book is loaded with advice and nuggets of knowledge for savvy gift giving and how to coupe with pregnancy envy (I simply just enjoy eating the extra ice cream but thats just me). How can Savvy Auntie help parents? Is a great example of Melanie at work and why she wrote this book. NextMother’s Day is here now what?